sleep late. Very soon now Marvin & I shall go down for a swim, then a movie, supper, & back to the base once again. How I miss the ice cream & cookies every night before going to bed! Those are precious memories, and shall be enjoyed again one day. For your information, I think I have now received all the letters you wrote about the time I came over here, including the quarterly. This is all till next time. Everything goes well. 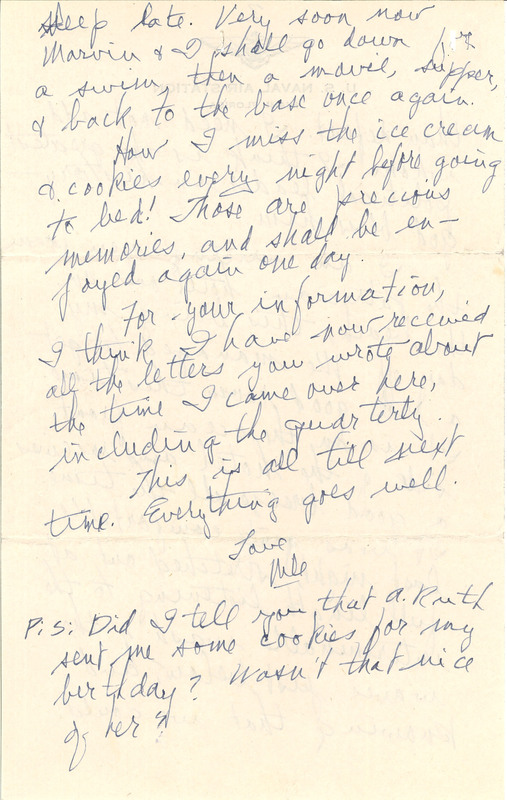 Love Nile P:S: Did I tell you that A. Ruth sent me some cookies for my birthday? Wasn't that nice of her?